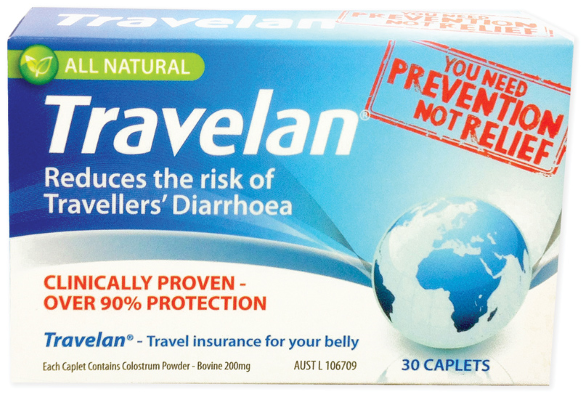 Travelan® is a natural product, clinically proven to reduce the risk of Travellers’ Diarrhoea (Bali Belly or Delhi Belly). Travelan® is a natural product, specifically designed to reduce the risk of infection by Enterotoxigenic E. coli (ETEC), as well as Shigella, Salmonella, Campylobacter and other bacteria that cause travellers' diarrhoea around the globe. The active ingredient in Travelan® is hyperimmune bovine colostrum enriched with anti-ecoli antibodies. These antibodies bind to E.coli in the gastrointestinal tract preventing them from attaching to the intestinal wall and thereby neutralising their ability to cause diarrhoea and its associated symptoms. What is Travellers’ Diarrhoea or Bali Belly? Travellers' diarrhoea also known as Bali Belly, Delhi Belly, Montezuma’s Revenge, Tourist Trot, Rangoon Runs or just TD (travellers' diarrhoea), is a result of ingesting contaminated food and/or water. Where should I take Travelan®? Travelan® is designed to be taken before every meal. The active ingredient in Travelan® is hyperimmune bovine colostrum powder, a rich source of antibodies that bind to Enterotoxigenic E. coli in the gastrointestinal tract, preventing them from attaching to the intestinal wall and thereby neutralising their ability to cause travellers’ diarrhoea and its associated symptoms. Hyperimmune colostrum is developed under Immuron's proprietary technology to create high titers of antibodies to a range of E- Coli bacteria that is present in normal colostrum in very small amounts. Yes. Travelan® has undergone clinical testing in randomised, double-blind, placebo-controlled clinical trials. 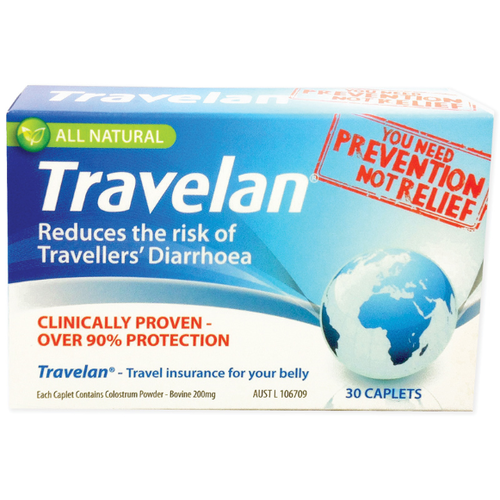 Clinical trials show Travelan® confers protection of up to 90% against infection with the major strain of E.coli that causes travellers' diarrhoea. In addition these trials showed a significant reduction in abdominal cramps and stomach pain compared to those who did not receive Travelan. There were no reported treatment-related side effects. Travelan® orders are shipped via Australia Post. Help other Immuron users shop smarter by writing reviews for products you have purchased.